"The war in Ivory Coast has caused problems with the internet," explained the owner of the b&b I was staying in. That sounded like horseshit to me, but who knows. 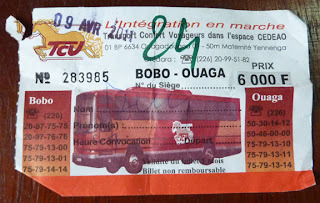 It certainly didn't affect the internet in the center of Bobo Dioulassou, where I sat for hours on the porch of a nice hotel, using their internet, ordering their food, and finally, chatting with a couple I'd met in the guesthouse. Nina, Frank, and I talked for hours. Why not? It was the middle of the afternoon on a Friday. There wasn't anything else to do in Bobo, which is relaxed almost to a fault. And at night, we found takeout falafel, caught a shared taxi back to the guesthouse, and gobbled up our snacks at the dining room table. A nice relaxing day—though it could have been improved had I not been wondering how long I'd be banned from commenting on my own Wall on Facebook, after lots night's strange internet blip. And in the morning, I'd wonder briefly if I had malaria, determine I had PMS instead, get up early, catch another TCV bus, and move on to Ouagadougou, the capital of Burkina Faso.